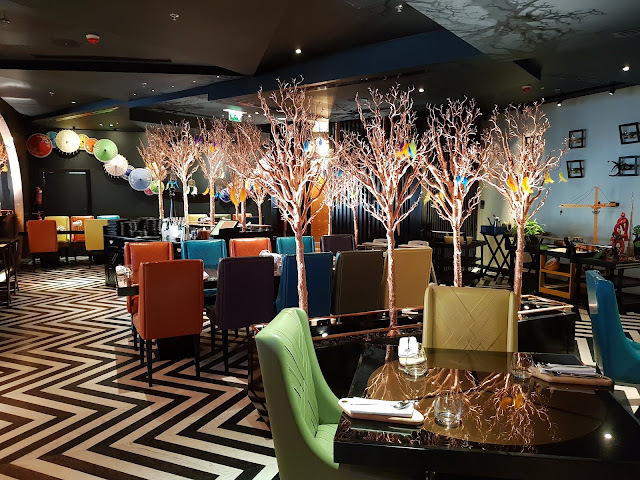 This is a place which focuses a lot on presentation, and along with that also has a very nice ambience that is colourful, yet classy; and that's just during the daytime. At night, it gets even better. They have different seasons (themes) every three months. 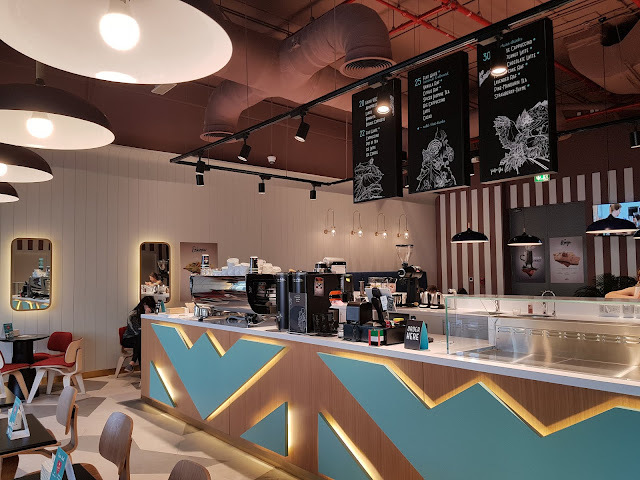 Their recent one is the La La Land during which they've also introduced business lunches priced at just AED 125 per head, which they invited me to try out. In this season they're focusing on the Indian food, and retaining its core flavour so that it remains very similar to the original taste, but focusing on presenting it in a way that is even more pleasing to the eye. They have 6 small plates (starters) and 4 big plates (mains) along with 2 desserts. This consists of some vegetarian and some non-vegetarian items and you can have unlimited quantities of all of them. What this place offers is more than just the regular donuts. 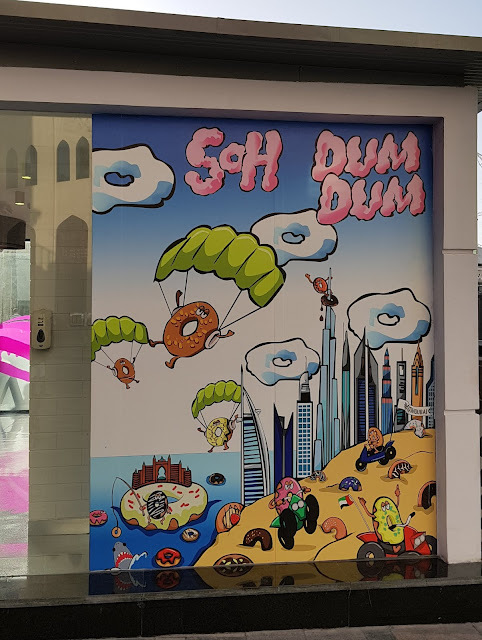 My friend took me here and she was trying to explain me what they sell before we could reach there, and she said it is something between a donut and a croissant. I was a litlle confused initially, but once I had it, I knew how difficult it was to explain. I can loosely describe this as a croissant with a lot more layers, in the shape of a donut. This place also calls it a "cro". I tried two of these and nothing else here, so this review is just about that. They're available in some tempting flavours like red velvet, kunafa, ferrero, dumdum Dubai, butter-scotch, kit kat, pink zebra, eaton mess etc. We chose one "Ferrero Crocher". This has Ferrero as well as chocolate. One bite, and it was pure indulgence. I just couldn't stop at one bite; and let me tell you that I am not someone who is much into sweets. After hearing about this place a lot and given the catchy name, I decided to check this one out. It was a weekday evening and still the place was quite full. The place felt a bit odd; especially the seating arrangement. If you're sitting on one of the table in the centre, it feels like those sitting around are watching you. Later, we moved to one of the side tables. These too were very near to each other, and felt like it was intruding personal space. It took ten minutes for them to get us a menu card, and another ten minutes after that to take the order. 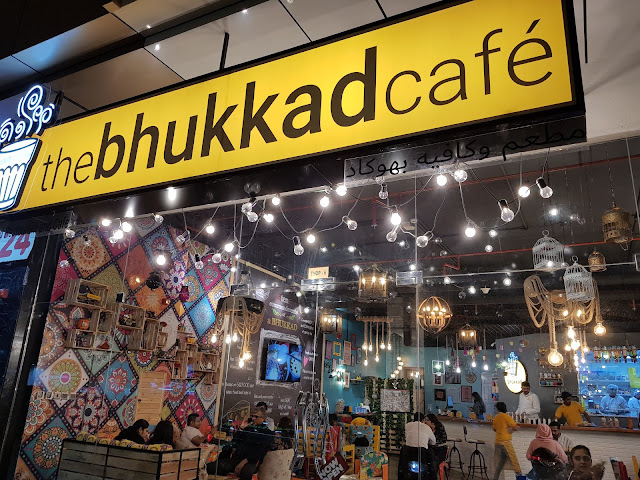 We wanted to have a pav-bhaji, and so asked them if we could first taste a spoonful of the bhaji before ordering it just like we do in many restaurants, but they refused. Perhaps they had a feeling that customers wouldn't order it once they have tasted. We took a risk and ordered nonetheless. This is a coffee shaop that has opened recently, and I've been seeing the photos on social media, and I couldn't wait to try it out. It is located in Citywalk near the fountain, and has seating inside as well as outside. I really like the ambience inside; it doesn't feel like a typical coffee shop (the kind you can have your meetings at), but is something that gives a feel that the people behind this really love what they're doing. The colour scheme is green, white, and brown, and that's different yet pleasing to the eye. We started with their Hario V60 which is a slow-brewed coffee. They used beans from Nairobi for this one. I really liked it. They also gave us dates with it, which complemented the flavour well. The next is the much heard cherry chocolate latte. Initially I was a bit apprehensive as to how would this combination taste, but it tasted really nice. It was creamy, and the flavour of cherry wasn't over-powering. It was well balanced. 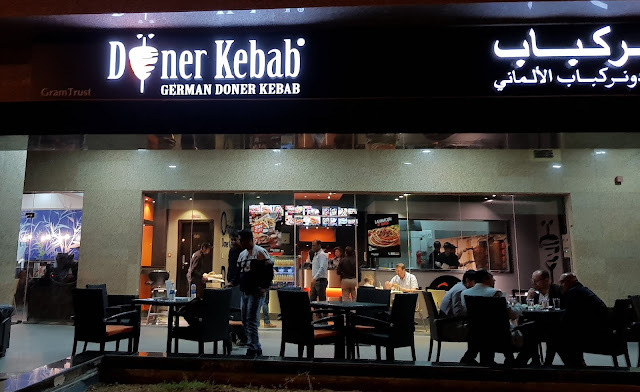 The dönerkebab is a Turkish style kebab cooked on a vertical rotisserie (like a shawarma). In Germany, it is served in a pocket of bread. This is what this restaurant serves. I have been to their outlet and I liked it; later, they invited me for this one. This outlet isn't too big but they have outside seating too which is a good thing. People usually have the döner sandwich here; I decided to opt for something different. I tried their lamhacun, which is something like a manakeesh, but they wrap it up. Also, they have a see-through kitchen so you can see them making it all in front of you. The lamhacun wrap was really delicious, and the sauces really accentuated the flavor. I found this better than the döner sandwich which I ate in their other outlet. They also gives the sauces on side additionally. I took this one as a meal which comes with fries and a drink. The fries were thick and crispy, and I liked them.